Georgie Tyler: Very Inspiring Blogger Award! Fancy that! 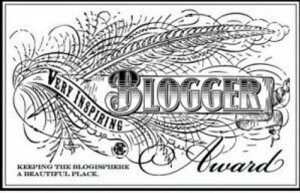 I've been nominated for a 'very inspiring blogger' award by the lovely Dani-Lyn Alexander, author extraordinaire. I'm over the moon as I'm only new to this social media 'stuff'. Pre October 2012, I would not write comments on Facebook let alone even contemplate a blog. However, when I received my first contract to publish my novel SEEKING EDEN, my husband insisted that I get on board and in one afternoon I had a FB, twitter and a blog set up ready to go! God, I was so nervous when he stood over me and said 'write something'. I clammed up. If you go back to my very first blog posts they are quite short as I wasn't quite sure why anybody would really be interested in what I had to say. I still don't. I do seem to get quite a few views, but not sure who these people are. So, if you do pay my site a visit, please let me know, even if the only thing you say is 'hi'. I'd love to connect with you. Unlike other blogs that provide writing tips, how to promote your book etc mine is more an insight into my life and what I'm thinking at the time. I try and insert some humour into my blogs, not sure if it works though as I'm definitely no comedian! But, it's fun and I can't believe I didn't do earlier in my life. You may be thinking why I haven't posted anything for a while (or maybe not. I'm going to tell you anyway!). January has been a very busy month for me as I am studying and have had a lot of work to get through. Throw kids on school holidays, Christmas and going away for ten days into the mix and well it's been full on. I'm also working closely with my editor as SEEKING EDEN is due to be released in April, and being a novice, I know she has her work cut out for her, as I do. I love it though, and am so grateful to have such a wonderful lady guiding me along this steep learning curve. Thanks again to Dani-Lyn who I interviewed on my blog. Take a look if you haven't already. I am married to Mr A and have been for 17 years. He's an 'ideas' man. I have 3 children. Two boys and one girl aged 13, 11, 8. I'm in awe of them and what they do. I have coached all my children's soccer teams, currently coaching my daughter's. GO PINKS! Here are the bloggers I nominate for this award: (I know it's only 9, but I don't know any others). Link back to person who nominated you. Nominate 15 bloggers for this award and link them. Hi Georgie! Thanks for thinking of me:-) I'm very touched! I'm not sure I can do 15 authors either, but I'll see what I can do. Lovely story about your publication story too! Thanks so much Georgie! Your blog is gorgeous :) I will aim to write up my post today but if I don't will do it after we get back from a few days away. Going tomorrow, so packing like crazy atm! x Rach! Georgie, you are a sweet breath of fresh air. Your honest post made me grin because been there done that, and not that long ago. Kudos to Mr A for pushing you along. You're doing a great job.